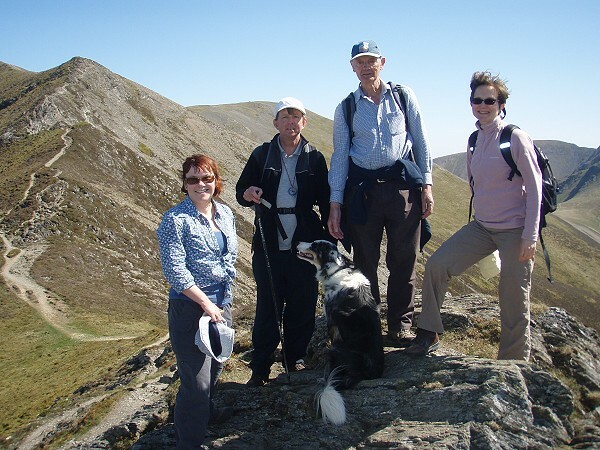 Next week is the 5th Keswick Mountain Festival with lots of walks for you to join. 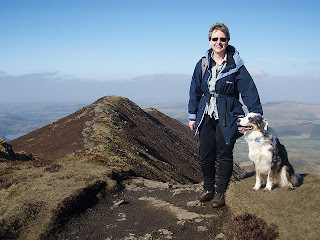 On Friday 20th May I have a walk along the ridge to the south west of Skiddaw - Ullock Pike, Longside Edge and Carlside. A delightful steady ascent from the toe of the ridge gives superb views down to Bassenthwaite Lake in one direction and across to Skiddaw in the other. 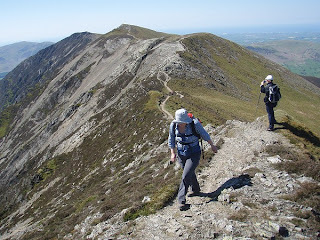 From Carlside, rather than turning left and slogging up the scree to Skiddaw we'll turn right and go down towards Dodd whilst enjoying the views over Newlands and Keswick. From Dodd it's a zig zag down through the woods followed by a stroll across the fields back to Keswick. Rather less climbing than going all the way up Skiddaw (800m rather than 1000m) this walk gives you all the best bits of climbing Skiddaw without the scree! Here are some photos from earlier trips on this walk to give you a feel for it. If you would like to go to the top of Skiddaw by this route Alison and Halle are taking a group up for Keswick Rambles onWednesday 18th May, also as part of KMF. Oh why did I volunteer to lead a Keswick Rambles walk up Catbells on Easter Sunday? 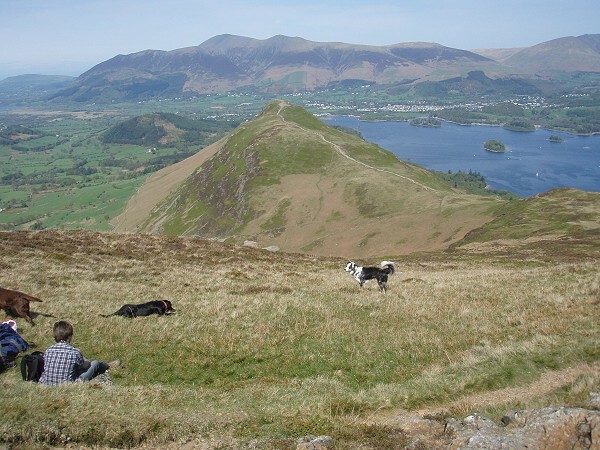 I love Catbells on a summer evening - but it will be busy, busy, busy at Easter, especially in this fantastic weather! A small group joined me to cross Derwentwater in the launch. 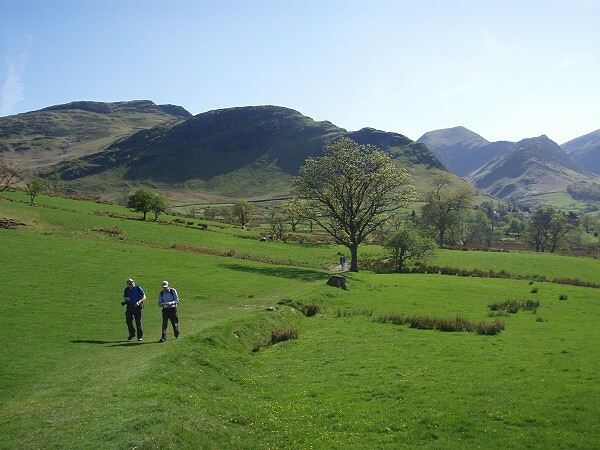 We got off at High Brundelhow rather than Hawes End which is the usual starting point for Catbells with extra boats laid on for Easter. This meant we could enjoy a quiet start to our walk through Brundelhow Woods with the bluebells just coming out. At the foot of Catbells we started to meet more people. 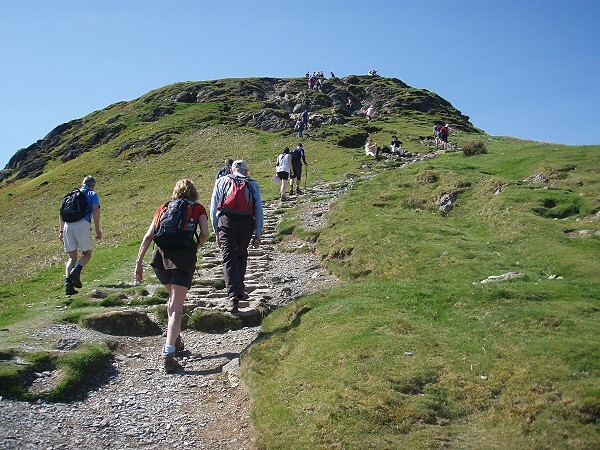 However, much to my surprise, the climb up the Catbells ridge was a delight with so many families enjoying their adventure. Children love the scrambly route up and with everyone in holiday mood it was great to share their first real mountain. We paused only briefly on the summit as about 100 people must have been picnicing there! 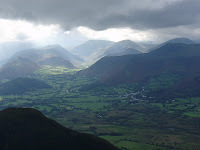 Down to the col and on up to Maiden Moor was far quieter and we enjoyed our lunch with a super view into Borrowdale. From the top of Maiden Moor we returned to Bull Crag and down steep grass into Yewthwaite Combe - not another soul here. This way down is my favourite route off Maiden Moor except in summer when the bracken hides the path. A rapid descent was made to Little Town where the Farm was serving tea and cakes - homemade corgette cake was scrummy. Strolled back across the fields and just made it to Hause End in time for the launch. One of my favourite walks in the Lake District especially in such glorious weather. We took the 77 Honister Rambler bus round to Lanthwaite Green before climbing the rocky path up Whin Ben and on up to the beginning of Whiteside ridge. The views back down over Crummock Water were stunning and as we climbed we could see more and more summits peeping out over the neighbouring ridges. You can see from the picture how Whiteside got its name - the rocky outcrops on the eastern slopes of the ridge glistened in the sunshine. There is a mile of undulating, twisting ridge (and a stop for lunch and enjoying the view) to enjoy before you reach the summit of Hopegill Head. Superb views to the east right across to Helvellyn, Langdale Pikes and Scafells as well as to the west across the Cumbrian coast to the Solway Firth, Scotland and, just visible, the Isle of Man. From the summit of Hopegill Head another mile or so of ridge walking brought us to Grisedale Pike and a descent down the ridge to Braithwaite nad ice creams before catching the bus back to Keswick.